Adapted from material contained in History of Mendocino and Lake Counties by Aurelius Carpenter and Percy Milberry, published 1914. The Middletown Independent was established in 1886 by P. B. Graham and J. L. Read. Read bought Graham's interest in 1889 and later in the same year sold a half interest to W. C. Pentecost. In 1895 Read again acquired full control, placed T. A. Read as editor until 1899, and then Warren E. Read until 1904, when the paper was sold to J.D. Kuykendall. The latter conducted it one year and sold it back to J. L. Read, Warren Read again becoming editor. On October 11, 1906, the paper passed to A. O. Stanley, who published it up to January 1, 1911, when he leased it to his son, "Mort" Stanley, one of the present owners (at 1914). The Independent was Republican in politics up to 1906, and independent since. Joseph L. Read has filled the office of postmaster, which he still holds,for over a quarter of a century, and in that position and as founder and publisher of the Middletown Independent, the first newspaper of the town, he has been one of its best known and most influential residents. He became postmaster in 1879 , holding the office until 1885. At the same time, in partnership with P. B. Graham, he started the first newspaper in the town, the Independent, with which he was connected, though not continuously, for a number of years, selling his interest and buying it back. Part of the time he conducted it alone, part of the time as member of the firm of Read & Pentecost, after which he again became sole owner; later he sold out to A. O. Stanley. Mr. Read has lived in California since the early '50s, and in his younger years went through the varied experiences of pioneer times. Familiar with the history and development of this region through actual participation in its events, and thoroughly public-spirited in his attitude toward the working out of the best interests of Lake County, he is a true Californian, and his part in the opening and advancement of his adopted state and community has been highly creditable. Joseph L. Read was fifteen years old when his family came by oxcart to California. He recalls the trip very distinctly. The party was not bothered seriously by the Indians, but cholera had broken out on the trail, and there were daily deaths and graves all along the way. Many, discouraged, turned back. Samuel Read was the only one of their party to have an attack of cholera, but was saved by prompt medical attention. However, one of the sons, James A., died near the head of the Humboldt that year. Arriving at Diamond Spring, Eldorado county, Cal., all the men and boys went to work immediately in the mines, and the surviving members of the family are all residents of the state now. Joseph L. Read was born July 29, 1837, in Scott county, Ky.. and in 1838 was taken to Missouri by his parents, growing up on a farm in that state. The schools there were poor in those days, so that most of his education was obtained by experience, of which he had plenty. When the family settled in California he went to work with pick and shovel, at placer mining, and did well, and he also took advantage of the pay schools in the neighborhood, attending a few weeks each winter until he was grown. He first came to Lake county in the fall of 1860, and spent the winter. Then he went back to Eldorado county, but came again to Lake county in 1861, in which year he was married to Margaret Davis, of Big Valley, near Kelseyville. They settled in Dixon, Solano county, where Mr. Read farmed until 1874, since which year he has been a resident of Middletown, which town had been started in 1872. Buying a ranch two miles northeast of the town, he operated it for four years. In 1879 he became postmaster, holding the office until 1885, after Cleveland's election. Under the Harrison administration he was again appointed postmaster, vacated the office when Cleveland returned to the presidential chair, and was once more appointed under McKinley, sixteen years ago, having filled the position without a break in his service since. He is one of the oldest postmasters in the state. Though seventy-seven years old Mr. Read bears no evidence of his age except his gray hair and beard. His health is robust, and he is at his duties daily, looking after the business of the office personally, though his son is assistant postmaster. His contact with so many of the residents of the vicinity has given him a wide acquaintance, and his relations with his fellow citizens have always been pleasant, his intelligent and obliging service as a public official winning him a high place in their esteem. He has the confidence and respect of all who know him. Joseph Reed has been one of the vital forces in the life of Middletown, Lake county, for forty years, where his efficient cooperation in the progress of the community has gained him a place among its foremost citizens. Mr. Read is associated with church and fraternal work in the town, being a member and trustee of the Methodist Episcopal Church. He was made a Mason at Vacaville Lodge but is now connected with Callayomi Lodge No. 282, F. & A. M.
Ralph H. is his father's assistant in the post office and is a member of the Masons and Foresters of America. Thomas A. is a druggist at Middletown and is supervisor of district No. 1, Lake county. Thomas A. Read, son of Joseph L. Read, was born January 1, 1872, at Man- chester, Mendocino county, CA. He was but two years old when his parents settled at Middletown, where he grew up and received his education, attending public school. For twelve years he was connected with the Middletown Independent, during the last four years of that period as co-proprietor with his father, having bought out the interest of Joseph Pentecost. For seven years after that he was clerk in Piner's store in Middletown, until he became manager of the store at the Great Western quicksilver mine, three and a half miles from town, continuing to hold that position until the mine closed down, in September, 1909. He has since been in business for himself, having bought the drug store at Middletown, which he is conducting very successfully. 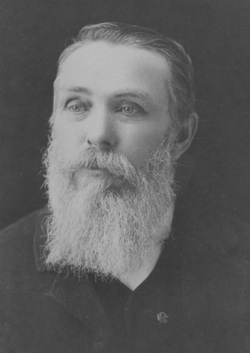 Thomas Read is one of the trusted officials of his locality, being Supervisor of the First District of Lake county, to which position he was elected in November, 1912. Like his father he is a stanch Republican, and he has been active in the councils of his party, having served as member of the county central committee. He is a Mason, holding membership in the lodge at Middletown, and in that connection, as well as in his business and official associations, holds the respect of all his fellows. In 1897 Thomas Read married Miss Nellie Fraser, daughter of Dr. Fraser then of Middletown although now residing at Point Richmond, Cal. Four children have been born to them, Lena, Lillie, Alice and Donald. The family has a comfortable home at Middletown.
" ... he and the rest of the family started the Methodist church in Dixon, CA in 1866. While going through pictures that belonged to my father, Donald Read Jr. who grew up in Middletown, I found this picture ... "
J. J. Read's younger brother, William E. Reed, settled in Middletown in 1881 and in 1884 was appointed minister of the Methodist Church. The Read family is of Scotch origin and was founded in this country by three brothers who came to America from Scotland, two stopping in the east (one in New Jersey) and the other, the progenitor of the branch at present under consid- eration, settling in Kentucky about the same time as Daniel Boone. Samuel Read, father of Joseph L. Read, was born in Kentucky. The spirit of the pioneer was in his blood. At the time his son Joseph was born he was living in Scott county, Ky., whence he moved in 1838 to Howard county, Mo., but soon afterward went to Sullivan county,where he bought land and was interested in farming until 1852. Meantime, however, he had crossed the plains with oxen in 1849, coming to California, where he engaged in mining for gold at Mariposa two years. Returning to Missouri, via Panama, he again came to California in the year 1852, and again crossed the plains with ox-teams, this time bringing his family, consisting of wife and seven children. Three other children had died in infancy. Samuel Read had married Elizabeth Leach, a native of Kentucky but a member of an old Maryland family. Her mother was born in Baltimore, likely of German origin. E. Elizabeth, wife of H. L. Burmeister. a retired farmer, living in Santa Rosa.